I mentioned in Patricks recent update, we've begun our weaning journey now and whilst we're still on total purees, I feel like we have a routine. The next step is definitely meat, I preempted quite a while ago that perhaps Patricks first taste would be Christmas Dinner, and I wasn't far off - well actually I am right it just didn't fall on Christmas Day. He sampled the Ellas Kitchen Christmas Dinner pouch last night and absolutely devoured it, the whole lot which I was so shocked about. I normally make all of Patricks food myself home made, but wanting to give him a trial run before Christmas I decided to give the pouch a whirl. I'd used these with Noah twice over two years ago and he seriously enjoyed them too, so I was already anticipating it would be a huge hit. Ellas Kitchen are a brand I can pretty much rely on, even now, Noah still likes the plain fruit pouches as he calls them 'smoothies', they're always perfect just to grab when we're on the go. Or on the rare occasion I need someone to look after Patrick, it's a lot more convenient for them to grab the pouch, warm and go. 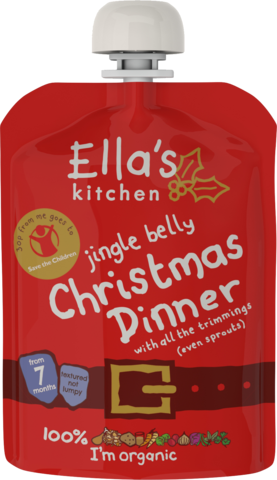 Their Jingle Belly Christmas Dinner pouch is extra festive of course, which I adore as an absolute Christmas fanatic, I even chuckled to myself having a long look over the ingredients because it's absolutely everything and more you could imagine feasting on over Christmas. But what I really love the most about this pouch, is not only is it filling your little ones tum this festive period, Ellas Kitchen are thinking of others. Every single pouch donates 30p to Save The Children, a cause I very much love. Christmas is a time of giving, traditionally to your loved ones, but it's always nice to go that extra mile and really think of others. I know not everyone can afford to donate, or even have the time to work out how to do so, but if you're going to be weaning your little one this Christmas, why not think about grabbing this pouch in favour of others, knowing that in doing so, you're helping someone else. All the proceeds are going to the award-winning Fmialies and Schools Together programme, run by Save The Children. FAST aim to promote the importance of Family meal time and the positive impact it can have on a little ones development. Again something I truly believe in, I pride myself on the fact my eldest eats like a dream, and I think a huge factor in that is that he eats around a table with not only his peers but his nursery co-workers too, as well as eating together as a family at home. Ellas Kitchen jingle belly Christmas Dinner is available in stores now and can be purchased from Asda, Boots and Tesco. BLOGMAS #25 | I Survived Blogmas!!! BlOGMAS #15 | Noah You're Three! BLOGMAS #14 | Patrick You're Six Months!